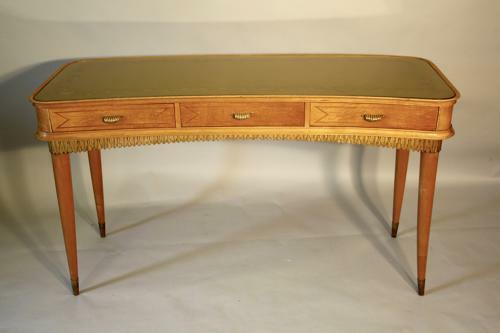 An elegant fruitwood inlaid three drawer curved dressing table with etched gold glass top. Unusal gilt wood fringe detail. Lovely original gilt metal drawer handle pulls and conical legs ending in gilt metal sabot feet. Would also work well as a desk or console. Italian c1950.